Can someone please explain the how grounding / earthing to prevent a person from getting electrical shock using simple illustration of a faulty electric iron connected to the 240VAC mains? I don't understand how a person standing on the floor tile in the house and holding a live equipment can complete the circuit for current flow. Where is the connection from the ground to the back to the equipment? The main point of grounding a line-powered appliance is to electrically "box up" the dangerous parts. 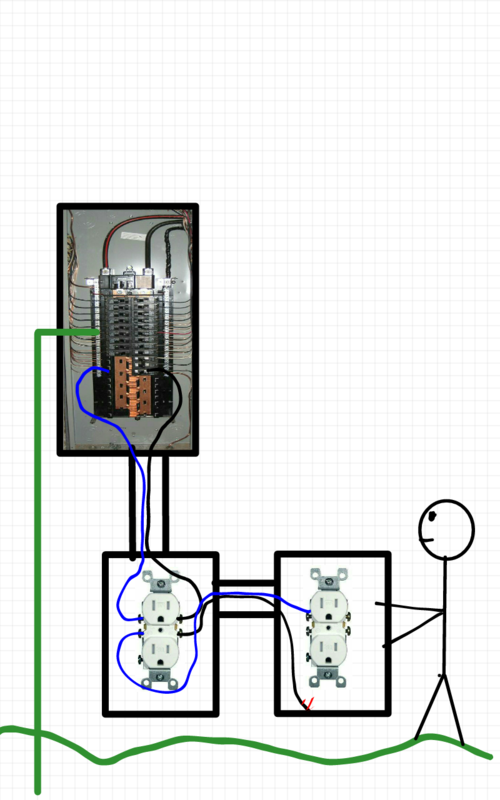 If, for example, a "hot" wire comes loose inside the appliance and touches the metal case, the current will flow thru the ground connection to that case. That will blow a fuse, trip a breaker, or trigger the ground fault interruptor if that line is equipped with one. If the case weren't grounded, then the same loose wire now puts the case at the hot potential. If you come along and touch it and something else grounded, like a faucet, at the same time, the full 220 V is now applied across your body. You are right that touching just a hot wire without touching anything else conductive won't hurt you. Presumably the "tile" floor you are talking about is made of insulating material. However, the reason this is unsafe is that often you are not completely insulated from everything else. If you touch the faulty appliance and happen to brush against a water faucet, the case of your desktop computer, a radiator, or any other appliance that is ground, you can be seriously hurt. Even a concrete floor can carry enough current to be dangerous. In my opinion you are asking two different questions, i.e. how can one be electrocuted and how grounding can prevent that. The first answer is quite easy: usually you don't get electrocuted just touching a live wire. The birds on the power lines live happily, but that's of course because they don't close a circuit so no current can flow in them. If you are wearing proper insulated shoes getting electrocuted touching only the live wire in a standard system is quite difficult... But usually people get electrocuted when using the hair dryer barefoot in a pound of water in the bathroom, that's how you close the circuit. You really need a little current to feel it, so you feel the shock also if the resistance to earth is quite big. Note also that the mains voltage is AC so even a capacitive coupling to ground is enough to get some current. Since the frequency is quite low you will need some high cap values to get somewhat high currents but you know, it helps a little. Grounding is another thig. You usually want to connect any exposed metal of a piece of equipment to ground so that no charge can build up on it for any reason and nobody will ever be electrocuted by touching it. Moreover if the insulation from live to the chassis fails you are getting a live to ground short instead of a live metal casing, and said short can be detected by a so called RCD, i.e. residual current device. If the difference between the current entering your house and the current coming out is non zero, i.e. is above some 10mA, the device will disconnect the mains from your house. And note that the difference is not zero if some current is "escaping" through ground, possibly flowing into a human. "Grounding" or "Earthing" performs two distinct operations. Firstly, let's tackle "old" style systems with just fuses. An earth wire, connected to the metal case of a device, provides a low resistance connection between than case and the neutral point of your home circuit. Depending on the earthing system used in your area that could be a direct connection to the neutral wire in your property, or to the neutral point at the power substation, or at other points in between. A fault developing in the device which causes the case to become live then has a path back to neutral through earth which causes a large current to flow. This current is enough to blow the fuse in the fuse box, or the plug, or the internal fuse in the device, etc. That then isolates the power making the device safe again. There are certain standards in place that define when you must have an earth connection and when you can get away without having one (look up "Double Insulated" for instance). So the earth wire is there mainly to cause the system to shut off the power before you have a chance to touch the device and get a shock. Now, on newer installations, and in certain safety situations (depending on your local regulations) you will have RCDs and ELCBs - Residual Current Devices and Earth Leakage Circuit Breakers (note: Americans call an RCD a GFCI). These are far far more sensitive than the traditional fuse. The ELCB works kind of like a traditional fuse in that it requires the earth wire to work. 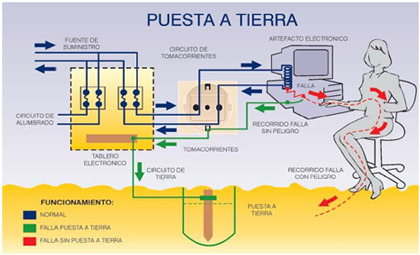 But, instead of it causing a huge current to flow it instead watches what current is flowing on the earth wire, and if it sees enough current, usually just a few mA, the it shuts off the power. Normally there should be virtually no current flowing through the earth wire, so if any is detected then it must be a fault. These are most often used with things like lawn mowers where there is a good chance you may cut through the cable. RCDs monitor the difference between the live and neutral currents. If there is a difference between them then it shuts the power off. A difference can occur when either current is flowing down the earth wire or through someone's body to ground (and back to the neutral point through the earthing system). I'm sorry this is in Spanish but I think you will understand. The green path is what current does when the device is grounded, it does not go through you because the "easiest" path is its ground connection. Electricity flows only when the circuit is complete. And our body is a great conductor of Current. So when somebody touch a positive pole of a voltage source, the electron comes from the ground a try to level the potentiality. So electricity will flow through body to ground. And that's not a good experience you want to have. That's why even if you are touching a positive pole of voltage source wearing sandal or non conducting shoes then you wont be affected. The human body acts like a capacitor to ground so it can pass alternating current in this way as well as conducting should a resistive connection be made to ground. Both can cause electric shock. On the face of it, grounding stuff appears to increase the risk of shock but not when you consider the RCD (residual current device or GFCI in North America) used on nearly all circuits in some jurisdictions. It measures the difference between the live current and the returning neutral current - if there's a difference of more than a few milli amps (i.e. there has to be a current directly to ground) it trips the circuit and prevents further shock. Not the answer you're looking for? Browse other questions tagged ground grounding or ask your own question. What makes someone “more” or “less” grounded, and how does this make electrocution more dangerous? How does earth ground complete the circuit?